What happens when we die? Do we really die alone? What if death is not the end but a new beginning? As the dying prepare to leave this world, they often begin to get a glimpse of what lies beyond through deathbed visits from deceased loved ones, strangers, and angelic or divine figures. Religious beliefs appear to have no bearing on these experiences—even atheists and nonbelievers have reported such phenomena. At times these visits are experienced by others in the room, offering incredible validity to the idea that life truly does continue. Report a wide variety of recent, documented deathbed visits from around the world. Introduce you to the many different forms of deathbed phenomena, including angelic visions, shared-death experiences, gateway or portal appearances, and many others. Highlight accredited research by renowned experts and scientists. Present substantial evidence—perhaps the most compelling to date—that we do not die alone. A Call from Heaven illustrates that death is not the end and that we all will be guided to the other side, comforting those who are grieving and removing the fear of death for all of us. Josie Varga is dedicated and passionate about her research into metaphysics and the afterlife. A popular blogger and motivational speaker, she strives to teach others why happiness is all a matter of how we think. 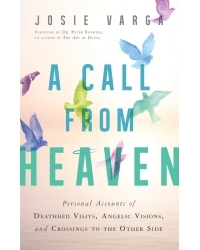 The author of several books, she is currently working on a television pilot based on her book Visits from Heaven. She also has a popular group on Facebook for people to share their spiritual experiences and find comfort in knowing that they are not alone. Josie lives in Westfield, New Jersey.